Elizabeth II (Elizabeth Alexandra Mary Mountbatten-Windsor, born 21 April 1926) is the Queen of the United Kingdom, and the other Commonwealth realms. She became Queen when her father, King George VI, died on 6 February 1952. Since 9 September 2015, Elizabeth II has ruled longer than any other king or queen in the history of the United Kingdom. She has also ruled longer than any other living king or queen in the world, since the death of Thailand's Bhumibol Adulyadej on 13 October 2016. The countries of which she is Queen are known as Commonwealth realms. Their total population is over 129 million. Although Elizabeth II is the queen of each country separately, all are independent countries. Elizabeth II lives and spends most of her time in the United Kingdom. In all the other countries where she is queen, a person is chosen to represent her. This person may be known as the Governor General. Elizabeth II has few political powers, and is not a ruler in the usual sense. She is Queen and interested in the running of her countries, but she does not tell the governments what to do. She has regular meetings with people from her governments, but it is they who run the countries. She performs ceremonies for the governments, gives out honours, and visits and supports many charities. Since 1947, the Queen has been married to Prince Philip, Duke of Edinburgh. Prince Philip was born into the royal families of Greece and Denmark. Just before they were married, he became a citizen of the United Kingdom, and changed his name to Philip Mountbatten. He became the Duke of Edinburgh on the day he married, and became a Prince of the United Kingdom in 1957. The Queen and Prince Philip have four children, eight grandchildren and six great-grandchildren. Elizabeth was born in London on 21 April 1926. Her father was Prince Albert, Duke of York, who later became George VI. His brother was the Prince of Wales. Her mother was Elizabeth, Duchess of York. Princess Elizabeth was the granddaughter of King George V and Queen Mary. She was named after her mother. Her nickname was "Lilibet". Princess Elizabeth had one sister, Princess Margaret. Margaret was born in 1930. The two young princesses were taught at home. They had a governess named Marion Crawford. Princess Elizabeth was third in the line of succession to the British Throne. The first in line was her uncle, the Prince of Wales. The second in line was her father, the Duke of York. She was third in line. Elizabeth's grandfather, King George V, died in 1936. Her uncle became King Edward VIII. He was king only for a short time. He abdicated. His brother, Elizabeth's father the Duke of York, became King George VI. One day, Princess Elizabeth would be Queen. Elizabeth was 13 years old when World War II started. London was bombed. Elizabeth and Margaret were moved to Windsor Castle. This was for their safety. People thought that they should be sent to Canada. Their mother did not approve this idea. Princess Elizabeth joined the British army in 1945. She drove a truck. She was a mechanic. In 1947, she made her first official trip outside Britain. She went with her parents to South Africa. She made a speech on her 21st birthday. She said her whole life would be devoted to the service of British Commonwealth and Empire. Princess Elizabeth married Prince Philip, Duke of Edinburgh on 20 November 1947. The wedding was held in Westminster Abbey. The couple lived mostly at Clarence House in London. The couple have four children; Charles, Prince of Wales was born 14 November 1948. Their second child is a daughter. She is Anne, Princess Royal. She was born 15 August 1950. The Royal couple had two more sons. Prince Andrew, Duke of York was born 19 February 1960. Prince Edward, Earl of Wessex was born 10 March 1964. The princes and princess often use the name Mountbatten-Windsor. This is their official last name. In 1951, the King's health was poor. He could not go to many public events. Princess Elizabeth started to make official visits for him. The King died on 6 February 1952. Elizabeth was crowned queen on 2 June 1953. The ceremony was held in Westminster Abbey. She wore a dress that was decorated with the national flowers of the countries of the Commonwealth. Many people bought TV sets to watch the event. In 1952, Her Majesty the Queen and Prince Philip moved into Buckingham Palace in central London. This is the main official home of the monarch. Her early years as Queen were spent traveling to many places. In 1953, the Queen and Prince Philip began an around the world tour in the Royal Yacht, Britannia. Their tour went for 6 months. She was the first reigning monarch to visit Australia, New Zealand and Fiji. In October 1957, she made an official visit to the United States. She spoke to the United Nations General Assembly. She toured Canada. She became the first monarch to open the nation's Parliament. The Queen likes to go to Canada. She calls Canada her "home away from home". In February 1961, she visited Turkey, India, Iran, Pakistan and Nepal for the first time. Since then, the Queen has made visits to most Commonwealth countries. She has also been to most European countries and many countries outside Europe. In 1991, she became the first British monarch to speak to a joint session of the United States Congress. She goes to the Commonwealth Heads of Government Meetings. She is the most widely traveled head of state in history. 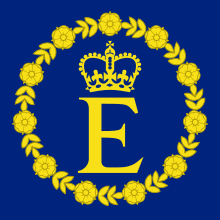 The Queen's personal standard, which is used in her role as Head of the Commonwealth. When Elizabeth became Queen on 6 February 1952, she was officially Queen of the United Kingdom, Canada, Australia, New Zealand, South Africa, Pakistan and Ceylon (now called Sri Lanka). These were the Commonwealth countries. There were many more countries that she also ruled, because they belonged to the British Empire. One by one, many of the countries became independent, and as they gained independence she became Queen of many of them. Altogether, she was sovereign of 32 nations. Some of the countries are now republics and have a president as "Head of State", while some of them keep the Queen as "Head of State". Queen Elizabeth II is the only monarch of more than one independent nation. The old British Empire became the Commonwealth of Nations. It includes both monarchies and republics. It is now called "The Commonwealth". The Queen is the Head of the Commonwealth. She works hard to keep peace and good communication between all the nations that are members. Ever since she became the Queen, Elizabeth has spent about three hours every day "doing the boxes". The "boxes" are two large red boxes that are brought to her from the Parliament every day. They are full of state papers sent to her from her various departments, embassies, and government offices. One of the most famous photos taken of Elizabeth as a teenager shows her with her father, the King, learning about "the boxes". Because she has been doing this since 1952, she knows a great deal about the government of the UK. At a state banquet at Buckingham palace, Her Majesty wears the Grand Collar of the Brazilian Order of the Southern Cross and a necklace of Brazilian aquamarines. When the Queen is in London, she meets her Prime Minister once a week, to talk about events. She also has meetings with the First Minister of Scotland and other Ministers of the Parliament of the United Kingdom, and the Prime Ministers and Ministers of other countries, when she is in their country, or when they visit London. In the late 1990s, there were "referendums" in which the people of Scotland and Wales were asked if they wanted parliaments that were separate from the parliament of the United Kingdom. This was called a "devolution policy". As a result, the new Scottish Parliament and the National Assembly of Wales, were set up. The Queen opened the first sessions of these two bodies. Recently, some people in Australia wanted a republic, with an elected or appointed President as Head of State instead of the Queen. In 1999, the people of Australia were asked in a referendum whether they wanted a republic. The decision of the people was to remain a monarchy. The Queen visited Australia the following year and said that she would continue to serve Australians as she had done for 48 years. Elizabeth II is friends with many world leaders. Her first Prime Minister of Australia, Sir Robert Menzies called her "My Dear" and recited a poem that said "I will love her till I die". She has friendships with Mary Robinson, President of Ireland (1990-1997) and George W. Bush, who was the first American President in more than 80 years to stay at Buckingham Palace. Nelson Mandela, in a BBC documentary, called her "my friend, Elizabeth". In May 2007, the Queen and Prince Philip made a state visit to the United States, in honour of the 400th anniversary of the Jamestown settlement. Elizabeth II, as the Monarch of the United Kingdom, is the "Supreme Governor" of the Church of England and sworn protector of the Church of Scotland. She is very interested in the Church of England, but the Archbishop of Canterbury runs the church. She rarely attends the yearly meeting of the General Assembly of the Church of Scotland. The Queen regularly goes to church wherever she is: at St. George's Chapel at Windsor Castle, St. Mary Magdalene Church at Sandringham House, Crathie Kirk at Balmoral Castle, and Canongate Kirk in Edinburgh, when she stays there in Holyroodhouse, her official home in Scotland. The Queen often meets with leaders from other religions as well. In 1980, she became the first British Monarch to visit the Vatican, where she was welcomed by Pope John Paul II. She made another visit twenty years later on 17 October 2000. Queen Elizabeth II is Patron of "The Council of Christians and Jews" in the UK. The Queen has shown a very strong sense of duty, ever since she was a girl. Her father, King George VI, was not meant to be king. Her uncle became king when her grandfather died. But he fell in love with an American woman who was divorced, and that wasn't allowed. So he had to give up being king very shortly after ascending. George VI didn't want to be king, because he was quite nervous and had a stammer. However, Elizabeth's grandfather said that he didn't think her uncle was very good as a king, and wanted George to reign, then Elizabeth. From the moment she realised that one day she would be Queen, she became very interested in her duties and did all she could to help her father. Her promise to serve her people all her life has always been very important to her. Some people think that now that she is old, perhaps she will retire ("abdicate") and let her son Prince Charles take over. People who know her well, including Prince Charles, have said that this will never happen. The Queen with Prince Charles and Prince Philip at the "Trooping the Colour" in 1986, riding her favourite horse, Burmese. The Queen has often shown courage, ever since she joined the military at 18. During a trip to Ghana in 1961, she was warned that it was dangerous to be near the President Kwame Nkrumah because people wanted to kill him. But she refused to stay away. The Prime Minister of the United Kingdom, Harold Macmillan, wrote that the Queen got very impatient with people if they tried to treat her like "a film star". In 1964, when the Queen was invited to Quebec, there were fears for her safety because there was opposition to her visit. There were suggestions that the tour should be cancelled. But the Queen's secretary said that the Queen would not want to be stopped from going to Quebec because of any danger. During the Trooping the Colour in 1981, she was shot at, but she carried on. The Queen was praised for her courage and for her ability to keep her horse calm. It was later discovered that the shots were blanks. In 1982, a man called Michael Fagan broke into Buckingham Palace in the morning, and found the Queen's bedroom. He woke her up, and sat on her bed, until the guards came to take him away. Throughout her long reign, Queen Elizabeth II has been supported in her duties by her husband, Prince Philip, Duke of Edinburgh. Prince Philip promised to help the Queen on the day of her Coronation. The Queen was also helped by her mother Queen Elizabeth, known as "The Queen Mother", who lived to be 101 years old, and stayed very active in her old-age. The Queen is the patron of many organisations and charities. She has many invitations and official duties. Many of the duties have been shared by other members of the Royal Family, who have also become patrons of many organisations. The Queen and Prince Philip with some of their family on the balcony of Buckingham Palace, 2007. On the left is Princess Beatrice, Prince William is talking to Viscount Linley. To the right is the Princes Royal, in Colonel's uniform. The Queen was sad about the broken marriages and divorces of three of her children, Prince Charles, Princess Anne and Prince Andrew. Prince Charles's marriage to Lady Diana Spencer was thought to be a fairytale wedding because Diana was young and beautiful, and they seemed very happy. But soon the marriage became troubled, and after their divorce, she was killed in a car accident in 1997. On 9 April 2005, Prince Charles married Camilla Parker-Bowles, whom he had loved for many years. In the year 2002, within a few months of each other, the Queen's mother and sister, Princess Margaret, both died. As the Queen is old, people worry about her health, but she is rarely sick. However, she is leaving more duties to the younger members of the Royal Family, particularly to Prince Charles, who will become King when she dies. 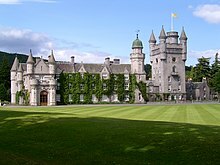 Balmoral Castle in Scotland is one of the Queen's homes. The Queen's wealth is private. It is difficult to estimate how much she is worth. She owns Sandringham House, Balmoral Castle, and other large properties. She does not own Buckingham Palace, Windsor Castle, or the royal collection of art. These are worth millions of pounds. In 2010, Forbes magazine estimated her personal fortune at about US $450 million (£300 million). In 1977, the Queen celebrated her Silver Jubilee. This jubilee marked the 25th anniversary of her coming to the throne. There was a royal procession in the golden State Coach. A service of thanksgiving was held at St. Paul's Cathedral. Millions of people watched on television. There were parties across the UK. Five commemorative stamps were printed in honour of the event. The Jubilee line of the London Underground opened in 1979, named after the anniversary. In 2002, Elizabeth II celebrated her Golden Jubilee. This jubilee marked the 50th anniversary of her coming to the throne. She toured the Commonwealth countries. There was a pop concert in the gardens of Buckingham Palace. A service of thanksgiving was held at St. Paul's Cathedral. The Queen and Prince Philip celebrated their sixtieth (diamond) wedding anniversary on 19 November 2007, with a special service at Westminster Abbey. The night before, Prince Charles gave a private dinner party at Clarence House for twenty members of the Royal Family. 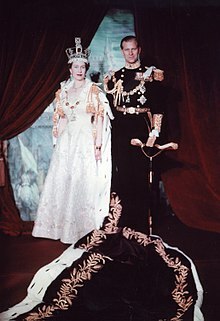 On the following day, 20 November, the Queen and Prince Philip went on a visit to Malta, where they had stayed from 1949 to 1951 after getting married. A Royal Navy ship, which was nearby, got its sailors to line up on deck to form a big number '60' for the couple. In 2012, the Queen's 60 years as monarch were marked by Diamond Jubilee celebrations, including a grand pageant of boats on the Thames and a service of thanksgiving at St Paul's Cathedral. In 2017, the Sapphire Jubilee marked the Queen's 65 years as monarch. She was the first British monarch to have a Sapphire Jubilee. Instead of large celebrations, as usual, the Queen spent the day in "quiet reflection" because the day was also the anniversary of her father's death. Commemorative stamps and coins were made in honour of the Jubilee, and a portrait of the Queen wearing sapphire jewellery was reissued. Also in 2017, the Queen and Prince Philip celebrated their seventieth (Platinum) wedding anniversary. They held a private celebration at Windsor Castle. Westminster Abbey, where they were married, held a three-hour bell ceremony. The Queen has several coats of arms. In the UK, they are known as the "Royal coat of arms of the United Kingdom". Every British monarch has used these arms since the reign of Queen Victoria. The coats of arms used in Scotland and Canada are different to the arms used in England and Wales. ↑ 13 UK Overseas Territories and three Crown Dependencies. She is also the monarch of 15 other countries: Canada, Australia, New Zealand, Jamaica, Barbados, the Bahamas, Grenada, Papua New Guinea, the Solomon Islands, Tuvalu, Saint Lucia, Saint Vincent and the Grenadines, Antigua and Barbuda, Belize, and Saint Kitts and Nevis. ↑ "Elizabeth Set To Beat Victoria's Record As Longest Reigning Monarch In British History". The Huffington Post. 6 September 2014. Retrieved 28 September 2014. ↑ "Historic speeches: 21st birthday speech". British Monarchy Official Website. Retrieved 2007-09-09. ↑ Prince of Wales's press office. ↑ "Elizabeth II, Queen of Canada". Canadian Royal Heritage Trust. Retrieved 6 March 2007. ↑ "1964 Quebec visit – speech". CBC. ↑ 9.0 9.1 Challands, Sarah (25 April 2006). "Queen Elizabeth II celebrates her 80th birthday". CTV Television Network News. Archived from the original on 30 May 2012. Retrieved 13 June 2007. ↑ Information supplied by the Royal Household to a parliamentary inquiry into the workings of the monarchy in the early 1970s. ↑ Elizabeth II (25 December 2000). "Historic speeches: Christmas Broadcast 2000". British Monarchy Official Website. Retrieved 9 September 2007. ↑ "Presidents, Vice Presidents and Board". Council of Christians and Jews. Retrieved 9 September 2007. ↑ "Courage of the Queen". Canadian Royal Heritage Trust. Retrieved 24 July 2007. ↑ "Queen celebrates Silver Jubilee". BBC News: On This Day. ↑ "In Depth: The Golden Jubilee". BBC News. ↑ Thames Diamond Jubilee Pageant, Key facts; retrieved 2012-6-3. ↑ Raynor, Gordon. "Diamond Jubilee: Duke and Duchess of Cambridge given key role in service at St Paul's," The Telegraph, 29 May 2012; retrieved 2012-6-3. ↑ "Gun salutes for Queen's Sapphire Jubilee". BBC News. 2017-02-06. Retrieved 2017-12-06. ↑ Association, Press (2017-11-20). "Queen and Prince Philip portraits released to mark 70th anniversary". The Guardian. ISSN 0261-3077. Retrieved 2017-12-06.